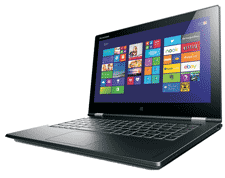 Lenovo Yoga 2 Pro 13.3" Best Buy Core i7 Laptop Intel-4510U 8GB RAM 256GB SSD. The Lenovo Yoga 2 Pro is a multi mode laptop with a super high-resolution Quad High Definition+ (QHD+) touchscreen that can fold back 360o, providing the ultimate flexibility between work and play. Thin, light and fast; it features Yoga Picks, which detects the laptop switching modes and recommends apps for each of the four usage modes -- Tent, Stand, Tablet and Laptop. The Yoga 2 Pro is for those who want their laptop to adapt to the way they use their device, for example, Laptop mode for focused tasks, Tablet for lighter, social browsing. Its 4 modes quickly allow the Yoga 2 Pro to adapt to any situation. Be as productive as possible when working, by placing your Lenovo Yoga 2 Pro into Laptop mode. The Phone Companion app is ideal for this mode. View images to share on social media using the Camera Man app. Fold your Lenovo Yoga 2 Pro back to place in Stand mode. Enhance your favourite pictures with the Photo Touch app. Place your Lenovo Yoga 2 Pro in Tablet mode to ensure entertainment on the go. The 13.3 super high-resolution QHD+ display can make you see the screen clearly from almost any angle with IPS wide-view technology. 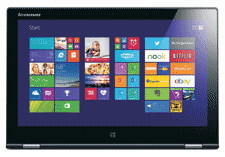 Enjoy greater accuracy with the 10-point multi-touch display, which is optimised to work with Microsoft Windows 8.1. Easily share files, photos, videos and more with tablet-style display with easy scroll and zoom functions. This innovative screen is sensitive and easy to use, making typing easier and offering a responsive gaming experience. 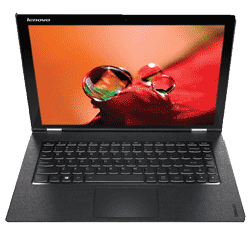 Packed with a powerful 4th generation Intel Core processor and preloaded with Microsoft Windows 8.1, the ultra-thin design of the Lenovo Yoga 2 Pro weighs 1.39kg (3.06Ibs) and is only 15.5mm at its thickest. The size, combined with the convenient Tablet mode makes the laptop very portable. 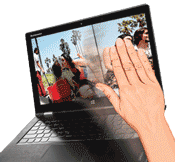 Lenovo Motion Control lets you quickly flip through photos, PowerPoint slides and e-book pages, or skip music tracks playing on your laptop with simple gestures. 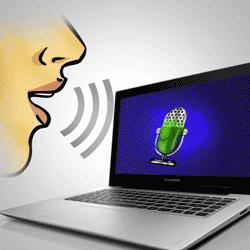 Meanwhile, Lenovo Voice Control allows you to execute simple commands by speaking to your Lenovo Yoga 2 Pro. On the Lenovo Yoga 2 Pro you'll find up to 8GB of fast DDR3L memory and up to 512GB of Solid State Drive (SSD) storage*. SSDs help you to access your files much faster than traditional hard drives, allowing faster application loading, as well as reduced start-up and shut-down times. Listening to music, films and games on your Lenovo Yoga 2 Pro will never be the same. With the Dolby Home Theater tools, you can experience riveting surround sound on your laptop PC. 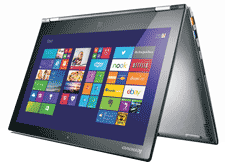 Dolby Home Theater technology enables the Lenovo Yoga 2 Pro to deliver a crisp, clear cinematic surround sound experience over its built-in speakers. It also adds clarity to sound from headphones. 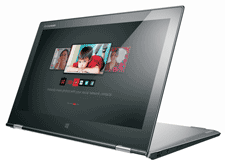 The Lenovo Yoga 2 Pro comes with multiple wireless connection options. The built-in 802.11b/g/n Wi-Fi adapter will allow you to enjoy reliable connections to the internet, while Bluetooth 4.0 makes it easier to connect and share files with other devices. You can also connect a compatible USB 3.0 device, such as an external drive, offering transfer rates 10 times faster than a standard USB 2.0. The Lenovo Yoga 2 Pro comes equipped with a long-life battery, so you can get the most out of your laptop PC between charges. You will be able to enjoy up to 9 hours* of online productivity and entertainment on-the-go before it needs to be topped up.